The Natural Makeover Diet was created by naturopathic doctor Joey Shulman to help women enhance their natural beauty through nutritious food, proper exercise and a balanced lifestyle. Shulman says that when you are unhealthy on the inside it always shows on the outside in a variety of ways such as puffy eyes, premature wrinkling, brittle nails or difficulty losing weight. In order to achieve true beauty it is necessary to address the causes of poor health rather than attempting to cover up these indications. Shulman provides readers with a program that she promises will result in permanent weight loss, shiny hair and a radiant complexion. She introduces her “Pick 3” diet plan, which makes it easy to select healthy foods that will support better energy and fat loss. The Natural Makeover Diet teaches you how to choose the right types of carbohydrates, proteins and fats at every meal or snack. Unlike the approach of many other weight loss diets, The Makeover Diet does not advocate a low carbohydrate way of eating, but rather prefers to emphasize what it calls ‘slow carbs’. In essence these are the carbohydrate foods that have a low glycemic index. As well as improving appearance and energy levels these foods can be of benefit for dieters who are at risk for developing diabetes. For the first five days of the Natural Makeover Diet you must avoid grains, sugars, red meat and dairy products. You also should consume a tablespoon of ground flaxseeds, increase your consumption of vegetables and drink eight glasses of water or herb tea each day. Following the initial phase a greater variety of foods are gradually reintroduced into the diet. The Natural Makeover Diet includes recipes, tips for eating out and a list of the glycemic index values for common foods. It also includes answers to frequently asked questions such as the potential benefits of red wine and chocolate and the pros and cons of high-protein diets. Fruit, vegetables, nuts, seeds, egg whites, omega 3 eggs, low-fat yogurt, low fat cottage cheese, goat cheese, tuna, salmon, chicken breast, lean turkey, avocado, whole grains, legumes, protein powder, soy cheese, soy milk, tempeh, olive oil. The Natural Makeover Diet recommends exercising five times a week for 30 minutes and engaging in a combination of compressive and expansive exercises. Compressive exercises are aerobic activities as well as those that put force on your spine and bones and can include weight training, fast walking and high-impact aerobics. Expansive exercises are those that open up and elongate the spine and muscles and include yoga and Pilates. 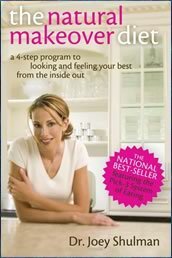 The Natural Makeover Diet: A 4-step Program to Looking and Feeling Your Best from the Inside Out retails at $18.95. May help to enhance natural beauty. Can assist with the management of diabetes and other blood-sugar imbalances. Very restrictive, especially in the initial stages of the diet. With the exception of the first five days, does not include a detailed meal plan. May not appeal to male readers. While The Natural Makeover Diet is designed to help women enhance their natural beauty it also offers a complete lifestyle plan that will assist with the improvement of overall health. By following the guidelines in The Natural Makeover Diet dieters will find it easier to manage their weight and boost their energy with improved appearance being a naturally occurring result of better nutrition and general well being.